The forecast for today was for heavy rain and strong winds. 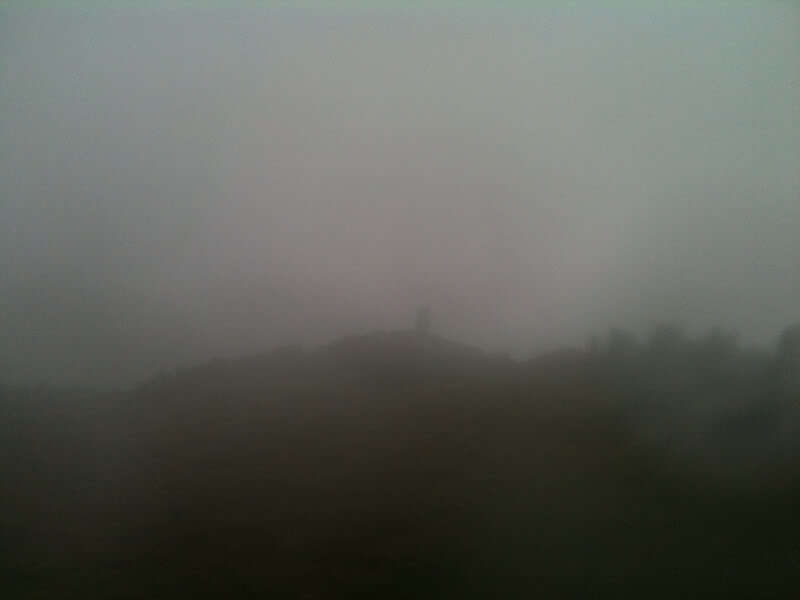 I decided to ascend a hill anyway, hoping the forecast would be wrong. The forecast was wrong, it was even worse than forecast! I drove along a narrow road to reach the starting point, where I squeezed-in at the side of the road. It was raining heavily at the outset. I got my DSLR out to take a quick photo but the camera was soaked within a couple of seconds of taking a picture. It therefore got resigned to my drybag and I used my iPhone, inside its waterproof case, for the remainder of the photos. I made my way across the initial fields trying to follow the marked path. I didn't have a paper map with me today, so I was nervously reliant on Viewranger on my iPhone. Nervous because visibility was non-existent. As I made my way through the fields, I could see a gap in the wall ahead which I made for. My real target of the day was Gyrn Ddu – a Marilyn. 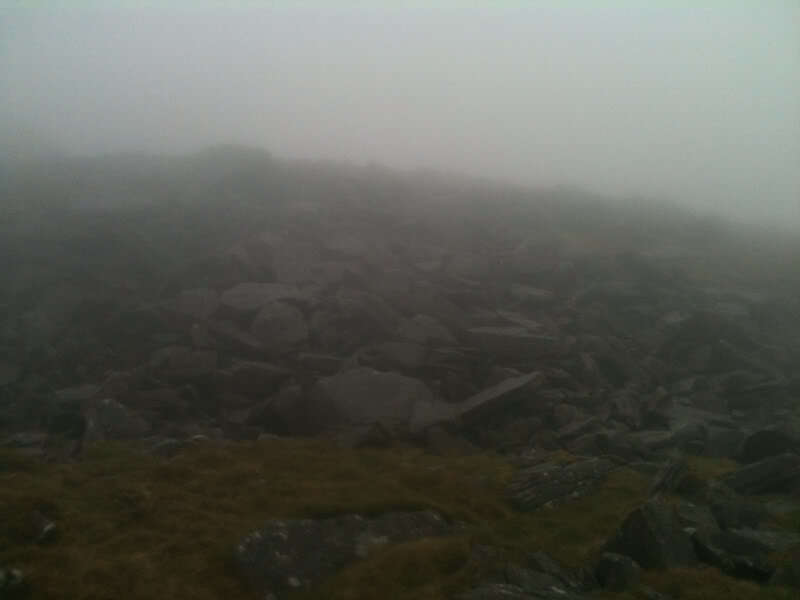 However, the HuMP Bwlch Mawr was so close that it seemed a shame not to also ascend it. 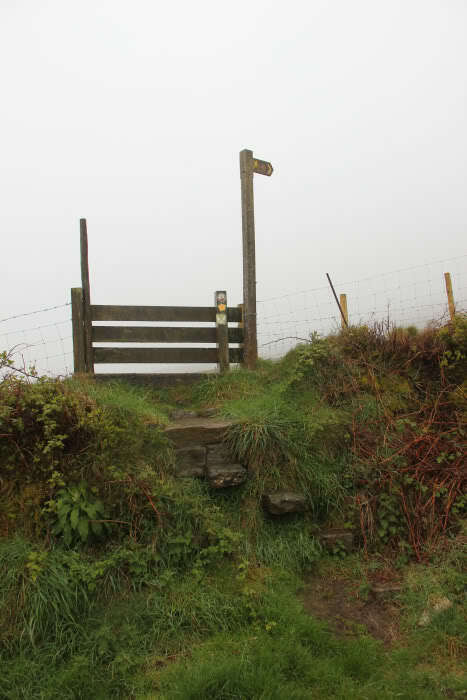 The ascent of Bwlch Mawr was quite straight-forward. 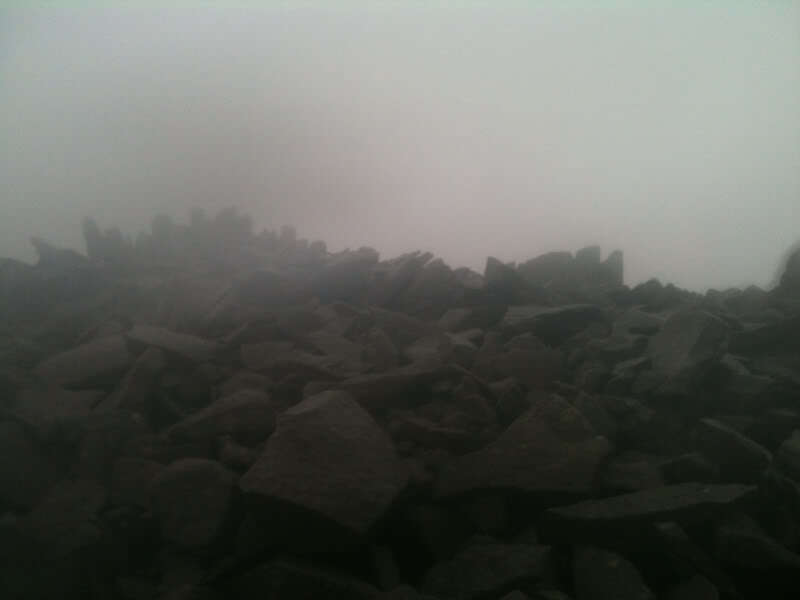 I skirted past the large pile of boulders to the left. Just before the summit I was faced with a high dry-stane dyke. I managed to climb over the dyke using some sticking out stones forming a sort of stile. The stones were very slippery. 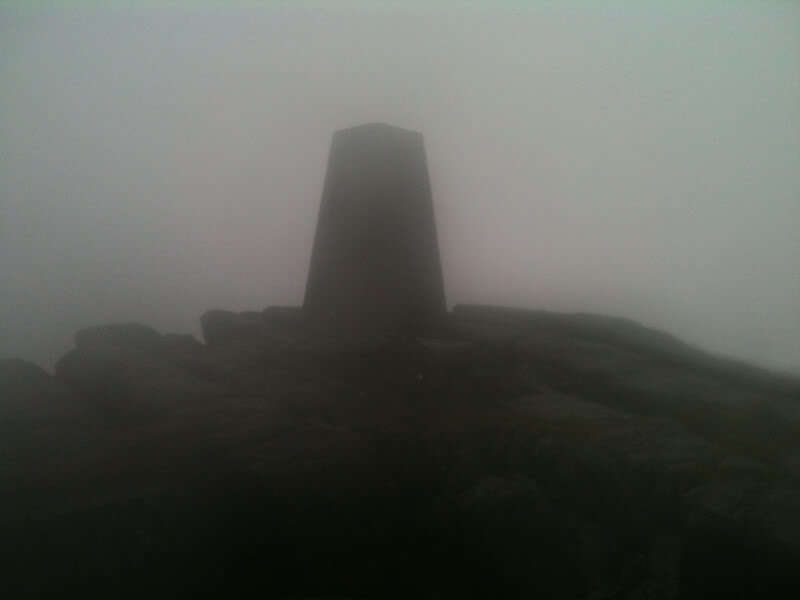 I visited the trig point and the nearby summit boulder. 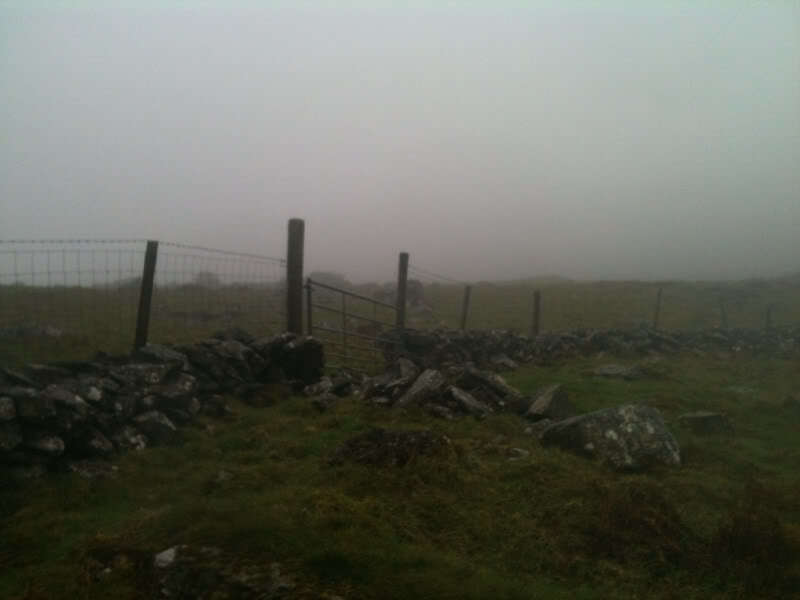 I returned from Bwlch Mawr back to the faint track. By now, my phone had already reduced to 50% power. Given I had no map, I decided to conserve the remaining power by turning off the phone in case I needed it later. I continued to follow what appeared to be the best path but realised I was now heading downhill. That didn't feel right. A quick power-on of the phone confirmed I was off-route. I therefore got my compass out and used it to ensure that I kept going in the correct direction. 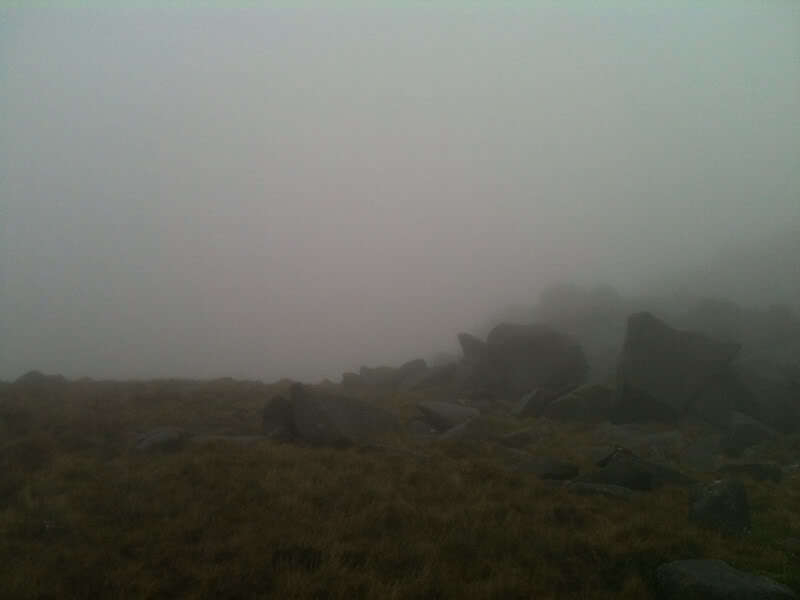 Visibility was only circa 10 metres. 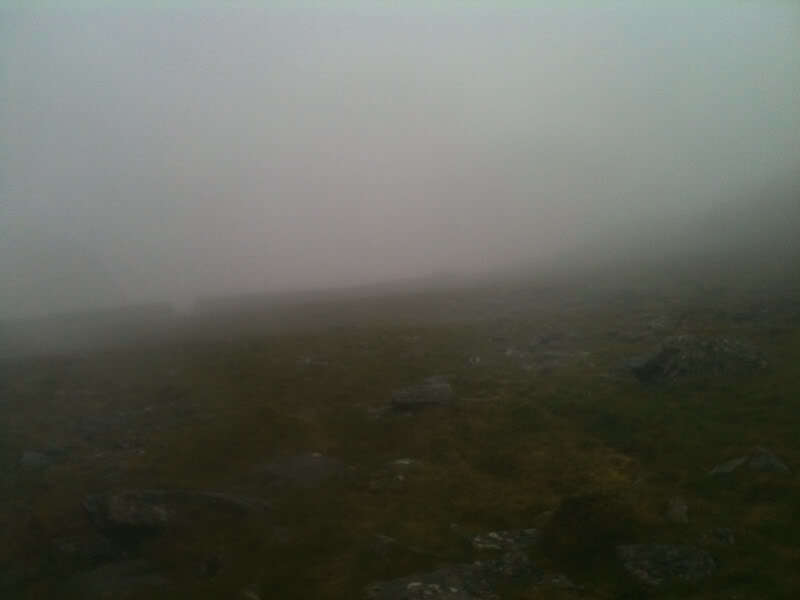 Using the compass got me to the 470m top of Gyrn Ddu, where I risked using my DSLR to take a photo but it got even more soaked than the first time. 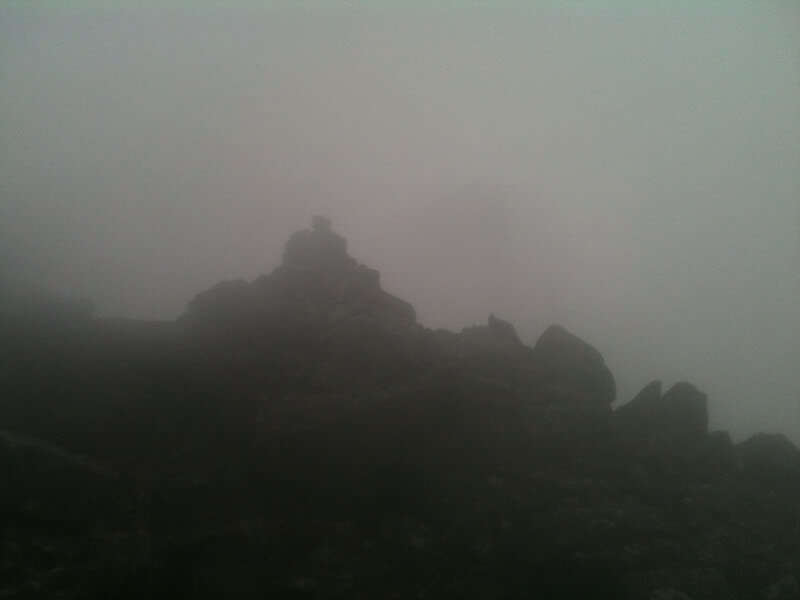 From the 470m top, I headed West to main summit. 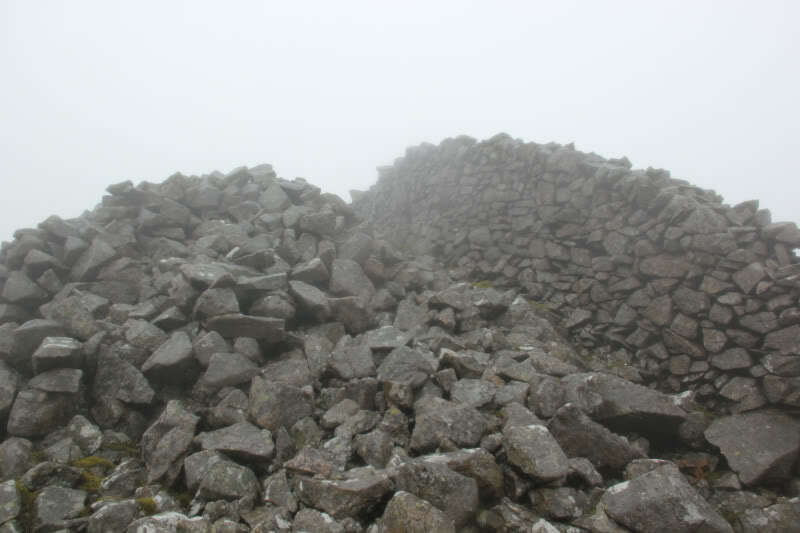 The final ascent involved climbing up 20 – 30m of boulderfield. This was quite difficult given the wetness of the rock and the strength of the wind. My boot soles struggled to grip the rock, so it was mostly a scramble using my hands. 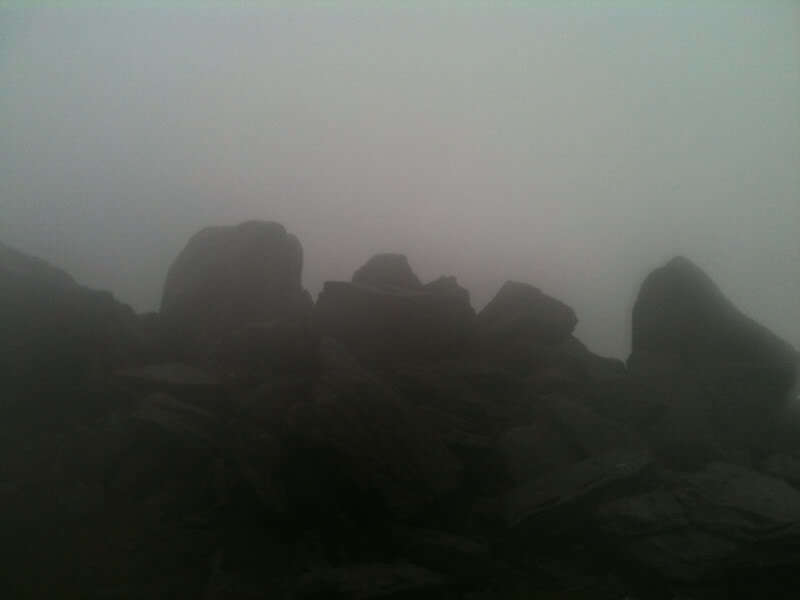 Anyway I reached the top, soaked through to the skin . I returned to the car via roughly the same route. Technology is certainly useful on days when visibility is zero. However, it has its limitations and I missed not having a paper map as a fallback. I'm glad my hill was only 522m high. Heading above 3000ft today would have been nuts. 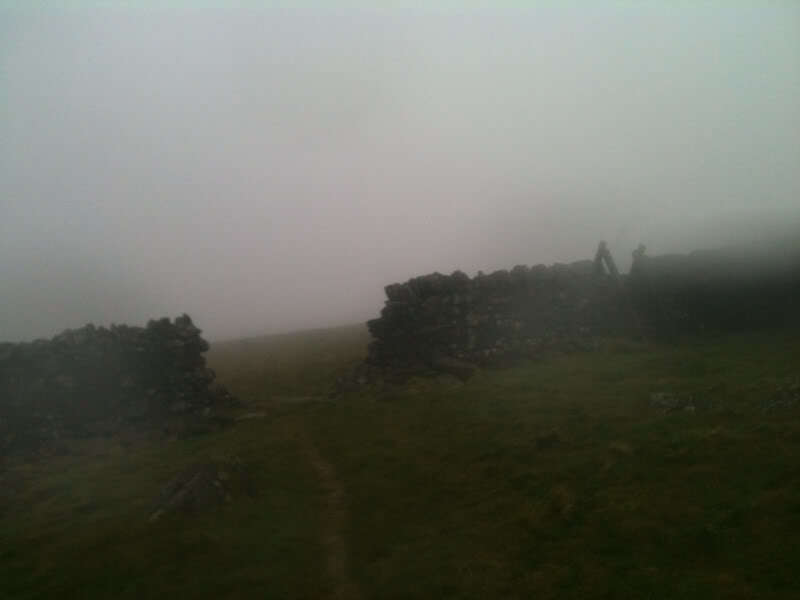 A 3Hrs 55Mins walk with 3Hrs 55Mins of rain and mist.